Picture above: Migrants push past Mexican police at the Chaparral border crossing in Tijuana, Mexico, Sunday, Nov. 25, 2018, as they try to reach the United States. 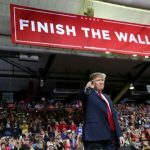 U.S. President Donald Trump told supporters at a political rally late Monday that his administration has no intention of allowing Central American migrants who traveled to the U.S.-Mexico border to enter the United States. His comments came a day after clashes in the area around the San Ysidro border crossing that divides the U.S. city of San Diego from Tijuana, Mexico. A group of migrants had been peacefully protesting long wait times for their asylum claims to be heard when some migrants split off and tried to breach the border. U.S. border patrol agents responded with tear gas to repel the group. 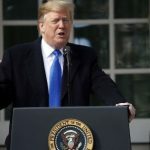 Trump praised the work of border patrol agents and the members of the U.S. military he sent to the border last month, while downplaying the seriousness of using tear gas. “First of all, the tear gas is a very minor form of the tear gas itself. It’s very safe,” he told reporters Monday. The incident prompted U.S. authorities to temporarily close the San Ysidro crossing, something McAleenan said his agency was prepared to do again if necessary to ensure safety. Vicki Gass, Oxfam America senior policy advisor for Central America, called the use of tear gas “a shameful response,” and said those fleeing violence and persecution should instead be met with compassion. Mexico’s Foreign Ministry said Monday it sent a note to the U.S. Embassy regarding Sunday’s events asking authorities to conduct a full investigation into the use of non-lethal weapons from the United States toward Mexico. It also reported 98 migrants involved in the clashes were being deported. The several caravans of migrants came mostly from Honduras, Guatemala and El Salvador. Their reception as they moved through Mexico was largely positive, but the situation in Tijuana has been more strained as the group of thousands of people now waits for their next step in an area that was already sheltering people who hope to have their asylum claims heard by U.S. authorities. Al Otro Lado, a group providing legal assistance to the migrants, is among those calling attention to the processing times at the border. It said CBP processed 60 asylum seekers on Monday, and that the backlog that existed even before the caravans arrived means another 2,000 people will need to be processed before any of those from the caravan can have their cases heard. Francisco Vega, governor of Baja California state where Tijuana is located, said there are about 9,000 migrants there, most of them in Tijuana with others in Mexicali. He appealed to President Enrique Peña Nieto and the federal government to consider the situation a matter of national security and to take responsibility for coping with the effects of having so many people at the border. 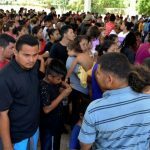 Vega said that while in the past people in the state have welcomed others with open arms, he faulted the government for allowing the caravans to advance through the country without any type of immigration control. “And now we are paying the consequences,” he said. Mexico’s interior ministry reported in early November that more than 3,000 caravan members had requested refuge in Mexico.